I welcome more information about this couple. Maps helped me understand confusing family information and land records but I’ll start from the beginning and explain what happened. 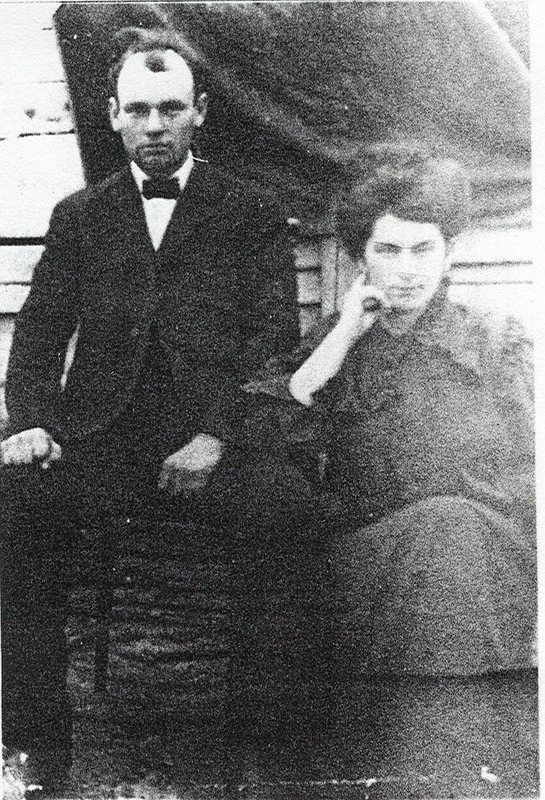 I have recently focused my research on my father’s father’s family. It is a large family that has been in the United States before we became the United States. I decided to begin by sorting the families by location. 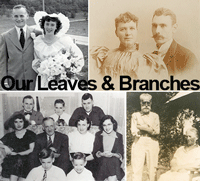 The oldest branches have their roots in Virginia. I made a note of the surnames from Virginia and the years I think they were there. Then I took out ‘NGS Research in the States Series, Virginia’ by Eric G. Grundset. 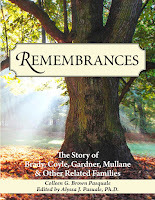 It was published back in 2007 but decided to read it through to find places to begin researching these ancestors. 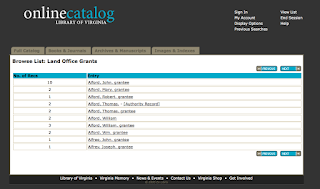 I read through the brief history of Virginia and moved on to the ‘Archives, Libraries, and Societies’ section. The first suggestion for research is LVA. This library looks amazing with information both in the library and on line. I read the guide, visited the website and was unsure where to dive in and begin detailed researching. 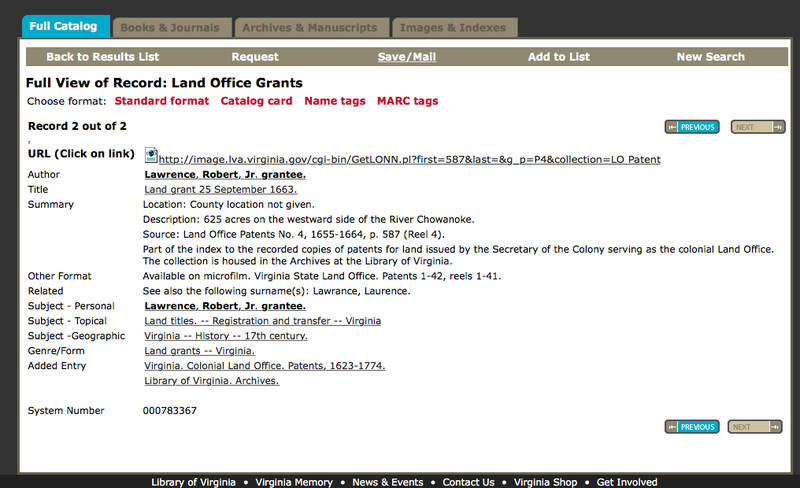 Then I saw ‘Best Sources for Virginia Research by Time Period’. I scrolled down to the 1607 – 1680 time period to discover what was available. 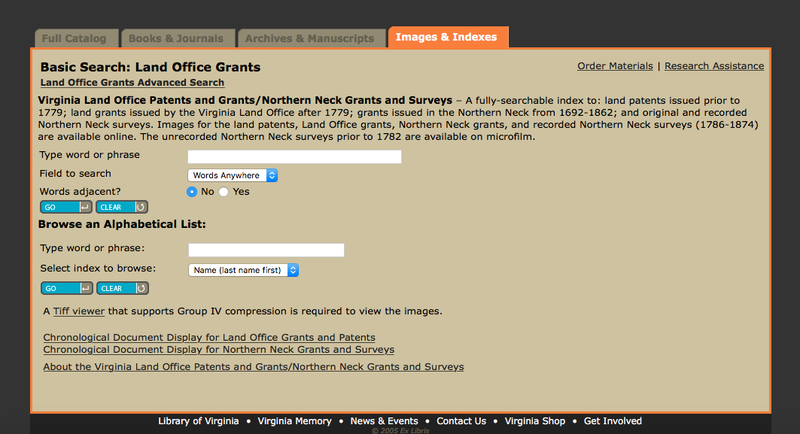 Under ‘Land Office’ I saw ‘Searchable Online Database’ and decided to begin there. 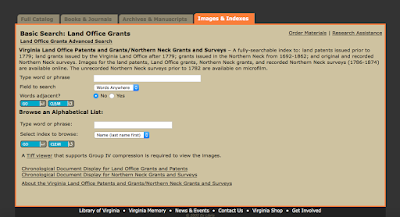 ‘Basic Search: Land Office Grants’ box appeared. I decided to ‘Browse an Alphabetical List’, putting in my surnames, one at a time. I put the surname Alford in the search box with no first name and found a list of Alfords. It did not take long to find my 7th great grandfather, John Alford. 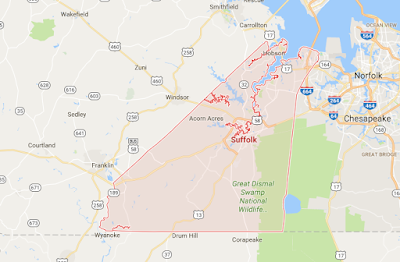 He had 410 acres on the south side of the York River in New Kent County, dated 20 April 1682. This is within the lifetime of my ancestor and in the area he was known to be living. I checked a second land record for Robert Lawrence Jr. He had 625 acres on the westward side of the Chowanoke River, granted 25 October 1663. No county was given. 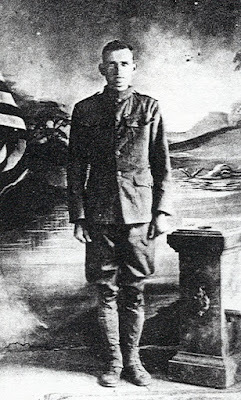 I was eager to connect this Robert Lawrence to my ancestor. I went to my Family Tree Maker program to double check what I already know about Robert. According to Whitley, Caroline B. North Carolina Headrights; A List of Names, 1663 - 1744. second Printing. 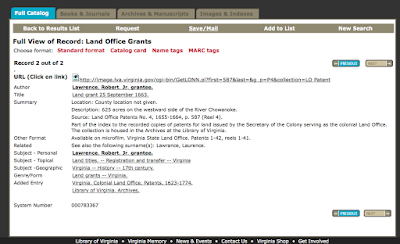 Raleigh, North Carolina: Office of archives and History North Carolina Department of Cultural Resources, 2008, Mr. Robert Lawrence, Jr. had 625 acres on the west side of the Chowanoke River, granted 25 September 1663. How could Robert be in both Nasemond Co., VA and in Bertie Co., NC? I knew he was born in Virginia and died in North Carolina but how could he be in both places at once? Did I have the right person? Were these different Robert Lawrences? I was confused and looked at all the information again. 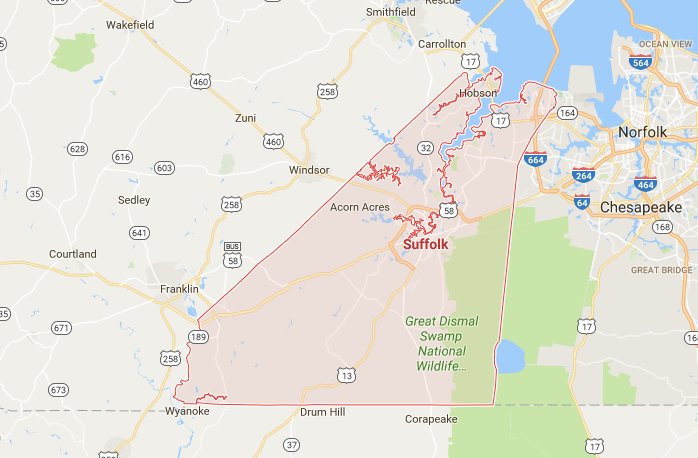 I used Google maps to look at Nanesmond County and Bertie County and quickly saw that these two counties shared a border and the Chowantee River flows through both. I believe it is the same piece of land that was recorded twice. I did an Internet search and found that the border between the states wasn’t firmly established until almost a hundred years after this land was recorded. Thanks to the maps, I am confident that there was just one Robert Lawrence and one piece of land and I believe that Robert was my ancestor. 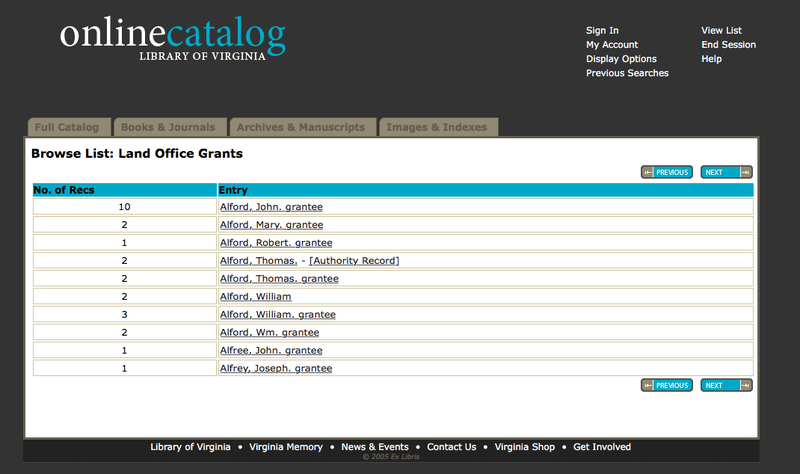 I plan to spend more time with the Library of Virginia. I believe I have just begun to uncover the resources that will help my research. Time to Write: Finished Writing! Back in October, I started posting about ‘Time to Write.’ My research about my mother’s family had reached a point where I needed to write it up. Months have passed with many hours devoted to writing, formatting and editing. Several blog posts have reported on my progress along the way. At last the editing is done. 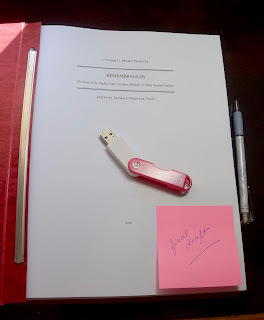 My daughter and I printed out the final draft, decided we liked the appearance and saved the book onto a flash drive. I contacted Troy Book Makers who published ‘The Mark Family Story’ which I wrote a few years ago. I have an appointment to take my flash drive and talk about printing ‘Remembrances.’ Going to their offices in the old red brick building in historic Troy, NY makes me feel like a ‘real’ author. I am looking forward to the date. 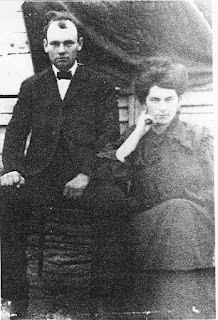 I have been looking at census reports for this couple and it has been difficult to sort out their children. I believe they had 14 children. 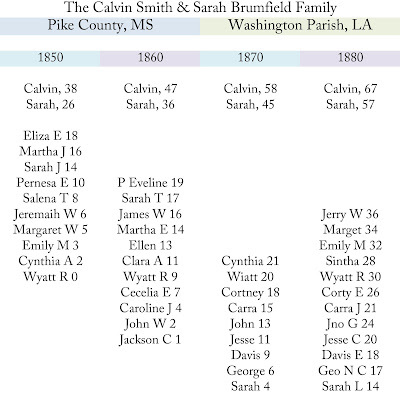 In 1850 the oldest girls listed were too old to be the daughters of Sarah. Perhaps Calvin had a previous marriage and they are his daughters. Perhaps they are Smith relatives who were visiting. Looking across the columns below you can see that names are not consistent. The census takers might not have clearly heard the names of these children or might not have been able to spell the names. Nicknames may have confused the names. For example Caroline is also called Carra. 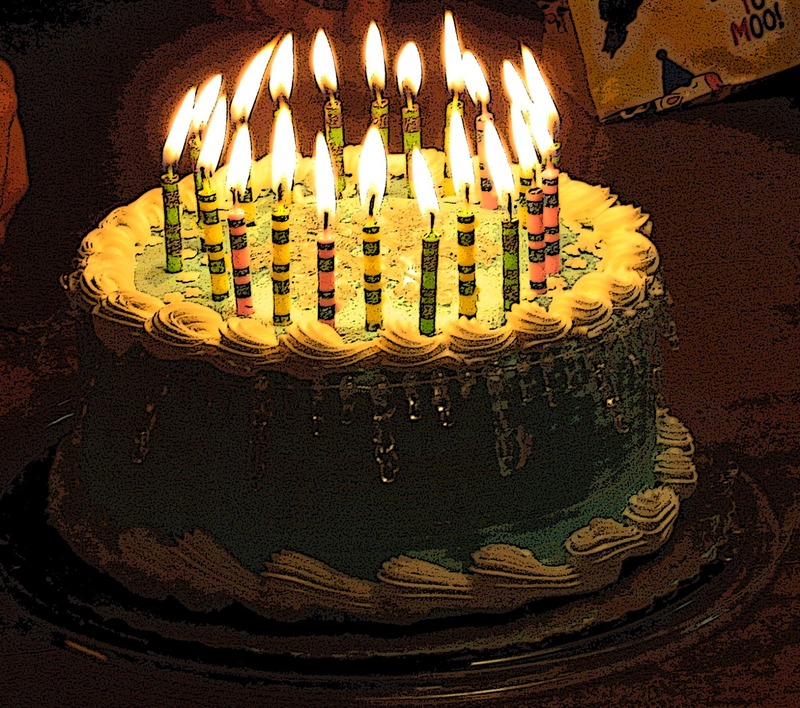 Wyatt R. Smith is the only child in all four census reports with the same name & appropriate age. It was helpful to look at the children who were older and those who were younger than Wyatt when trying to sort them all out. I cannot say for sure that I have sorted them out correctly. Are Jeremiah W., James W. and Jerry W. the same person? The ages work out. What about Jackson C. & Jesse C.? Could Cecelia & Courtney be the same girl? I think these are the same people but cannot guarantee it. 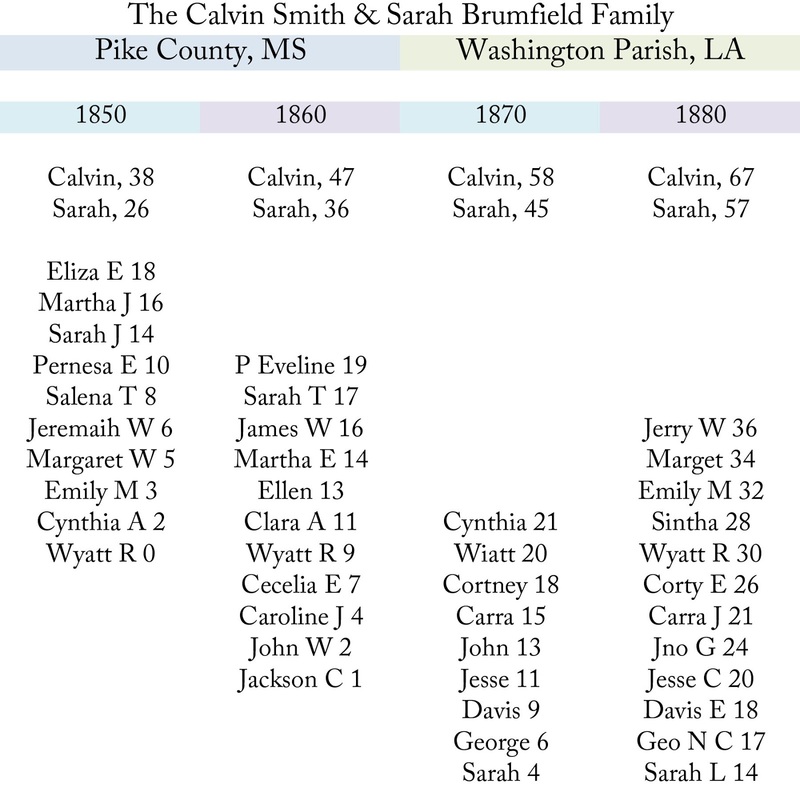 To add to the confusion the 1880 Census shows the 6 oldest children are married. Where are the spouses? No one is listed as an in-law. What about children, grandchildren of Calvin & Sarah? I used a spreadsheet to help sort out these children. Reading across the chart you will see, I believe, the same person in various reports. Take a look & see what you think. I welcome your opinions. I have Hubert's WWI draft registration card information & a photo of his military headstone but no record of his actual service. If you have details, I'd love to learn more. Hello & thanks for stopping by. I wish I could invite you in, offer you a chair & hand you a slice of cake. 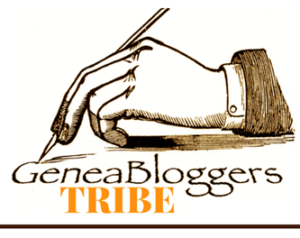 A blog is nothing without its visitors & followers. I love it when folks stop by, especially when they leave comments. Writing posts can be a lonely procedure but encouraging comments remind us that we are not alone in our interest in our family, our research & our writing.Thanks very much for your support!